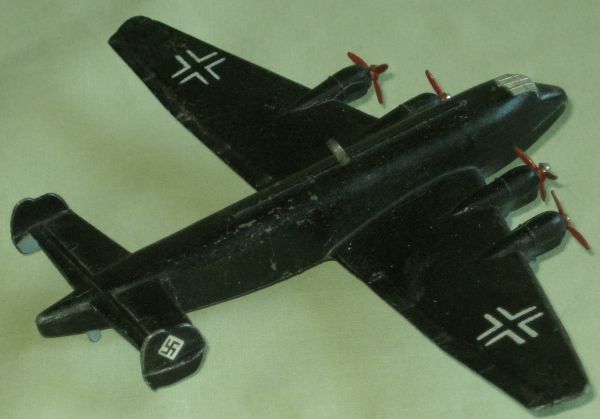 "The Junkers JU 89 Bomber was a modification of the No.62n J.U.90 Airliner and first appeared in May of 1940 in the Meccano Magazine. Unusually it is finished in a somber matt black over a light blue underbody, and it carries the German cross on the wings and the Nazis swastikas on the twin rudders. All models have stamped markings - no transfer decals were used . It has "HEAVY BOMBER" JU 89 cast under the wing. 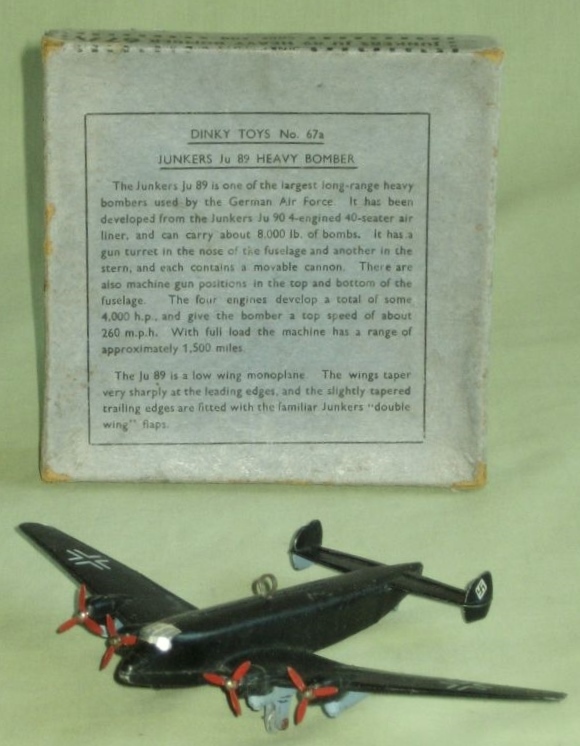 This is a very hard to find model today as it was available for only a few months and it would seem that most were cast using an unstable alloy as few today have avoided even some minor deterioration", (from "Dinky Toys Aircraft 1934-1979" by G.R. Webster, published in 2011). Fortunately my example is completely free of metal deterioration and comes with its original box. The date on the box indicates that it was produced in 4-40 (April 1940). Nice to see your Junkers, indeed a hard to find model in any condition. I have several models in my collection and assisted Geoffrey Webster writing his book. 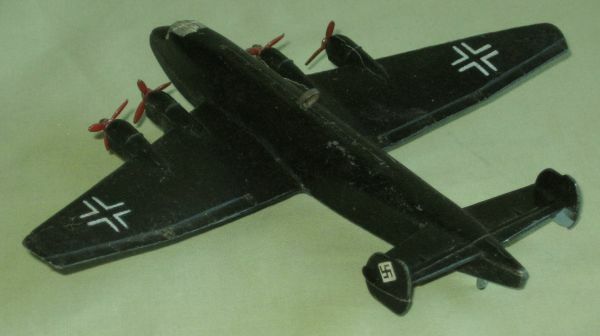 The models have inscription under the wing "Heavy bomber Junkers Ju 89". This provided by a interchangable tool in the die for Junkers Ju 90. 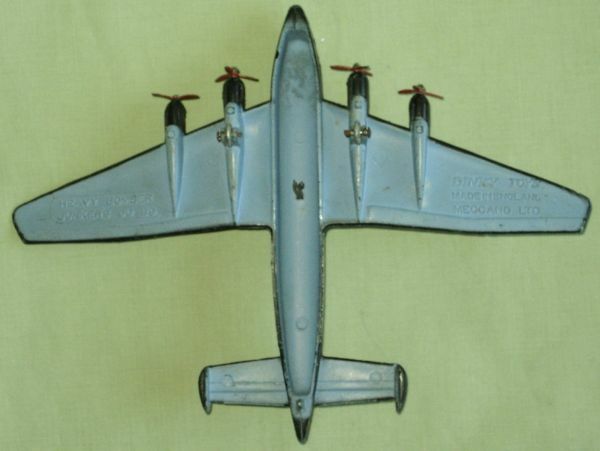 In my collection is a Heavy bomber with High Speed Monoplane cast under the wing. 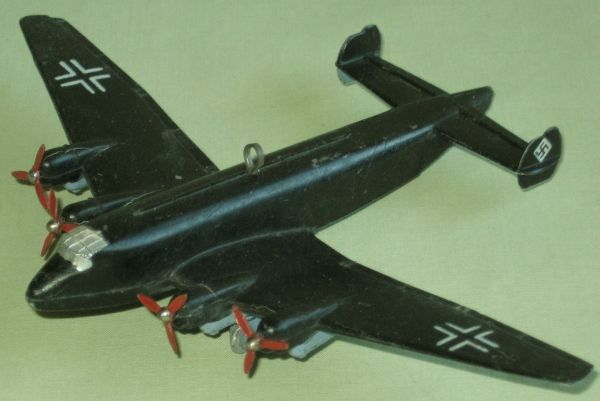 This model of course should have been painted silver as a Junkers Ju 90 and not as a Heavy bomber. We never will know why this happened in the Meccano factory, either someone forgot to change the tool or there was a shortage on castings for Heavy bombers while other unpainted casting were available. See pictures. For the Heavy bomber two boxes were made. First box with standard blue paper and code BW 15M 4-40. Second box with standard green paper and to be clear not faded blue paper. Code BW 10M 5-40. Not many green plane boxes were made, Set 66 and some trade boxes. The models always had gliding holes. Prop pins on early models rounded and later disk types. With a very small badge of only 25.000 bombers made and outbreak of WW II it is clear that not many have survived. Unfortunately the drawing for the JU 90 and Heavy Bomber never showed up. You have a lovely collection of JU89's. I especially like the one with the wrong name cast on it - a very special one! I use the book that you assisted in putting together, it is extremely useful in identifying the various models and the photos are excellent. 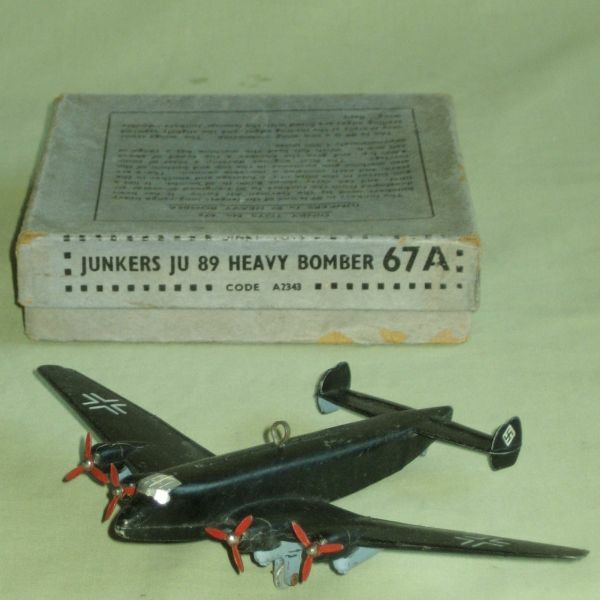 Normally I don't collect Dinky aircraft, but I do have one of the 67A Junkers JU 89s. Firstly, my model defintely has its markings applied by TRANSFERS (decals) and not stamped on the model. I found this out, much to my chagrin, when I tried to clean the toy and the decals started to lift off! Note the lifted corner on the markings and missing 'leg' . It also does not have the markings on he rear fins. Secondly, the 'Giant High Speed Monoplane' cartouche like John's. I guess theMeccano workers had other things on their minds at this period.